Products have become smarter. They have more requirements and interdependencies, and there are more of them than ever. As a result, the product development process has become a matter of managing complexity. Traceability, which documents the life of a requirement, is one key tool to manage the complexity challenge. When traceability is carried out correctly, teams can accurately assess the impact of changes, track the full history of product development, keep everyone in sync and consistently improve the quality of the products being built—every project, every release. This paper looks at five tips that will help you produce the kind of traceability that helps manage the complexity of the product development process. Each product you develop has customers, stakeholders and members of your team associated with it. Analysts define it. Developers build it. Quality assurance engineers test it. And stakeholders and customers care about its status. When one product requirement or item changes in the development process, it has a ripple effect on other related items and the people associated with them. Keeping track of this ripple effect is crucial to the success of the product. It’s one of the primary reasons organizations use traceability. Trace relationships are as much about connecting the people involved as they are about connecting all the items (see Figure 1). With effective traceability, you can connect everything together to map out the interdependencies among the different items. You can connect data and people and make it obvious who needs to respond when changes occur (see Figure 2). A good product development solution will help you anticipate the impact a change will have on your product and your entire team. Relying on the trace relationships you set up, the solution reports on the complete picture of all the items that are affected—both directly and indirectly. Figure 3 shows an example of an automated impact analysis report for a high-level business requirement in the Jama™ Software product development solution . If this requirement changes, it will affect three directly related system requirements, downstream software requirements and numerous verification tests. It’s important that your solution visually represents your product and system, helping you align users, maintain quality, meet compliance regulations and understand the impact of change. 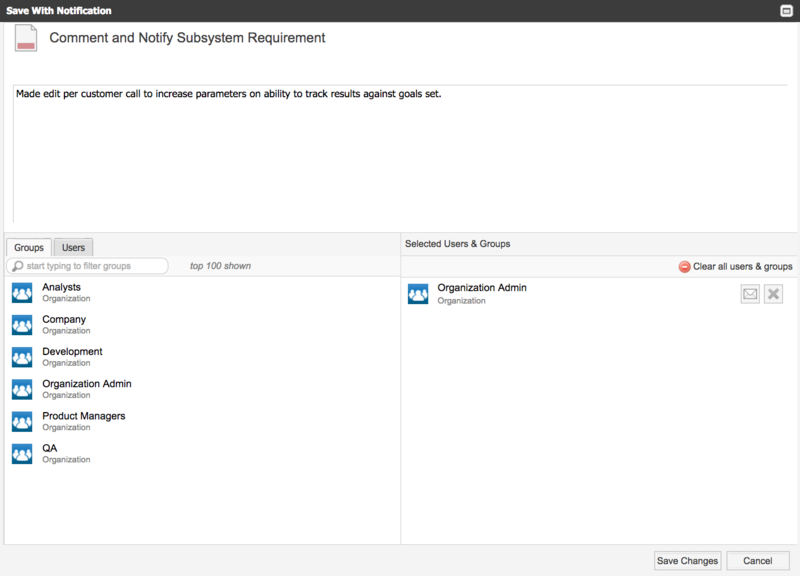 Users should be able to view related requirements and understand the status of those requirements. For example, they should be able to verify that their requirements have downstream test cases and see what percentage of those test cases have passed. Figure 4 shows a list of requirements along with their state in the first column. The second column lists the downstream verification tests for each requirement. From this view, teams can see what verification coverage they have and where verification tests are missing and get high-level verification results. Users can access every test case, comment and activity stream. Testers and contributors can capture decisions, answer questions, and transparently and responsively resolve issues. With traceability, there is a comprehensive audit trail of changes, so you can analyze who, what, when and why a change occurred. This is especially important for companies that need to meet industry compliance standards in specific fields such as aerospace and medical devices. Traceability allows you to easily roll back to an earlier version of your changes because everything is stored in a unified system of record. Figure 5 shows a side-by-side comparison of two versions of changes to a product, using an automated process within the Jama product development solution. To improve efficiency, the feature highlights a specific field in yellow so you can see the changes without having to hunt around the full requirements specification document to pinpoint and understand precisely what changed. As with the other aspects of traceability, you can track version history manually through static documents, but it’s more cumbersome and time consuming to manage complex projects that way. How often have you been involved in a project where you experienced email inbox overload? Often it occurs when the project manager emails the entire team a huge software requirements specification document every time a change occurs. Team members waste time hunting in the requirements spec to determine if the latest change is relevant to them, which is costly. Or they ignore the email barrage and miss a change that is important to them, which is even more costly. A good product development solution can instantly send a direct link to the specific requirement that changed with version notes to just the relevant groups or individual users it affects. 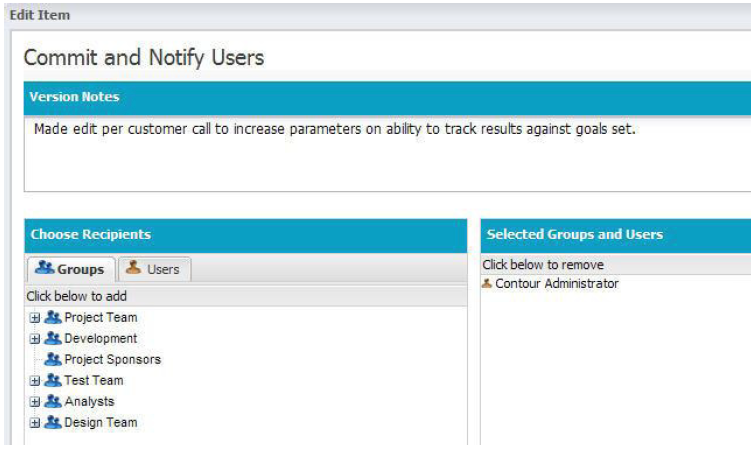 The notification step is then part of the overall change management workflow (see Figure 6). If your product development process is complex (many requirements, frequent scope changes or remote teams), automation can provide a huge boost to productivity. It greatly improves your ability to organize and visualize data and minimizes the risk of human error, which is always possible despite the best intentions of skillful staff. Traceability reflects your complex product data and simplifies the process of delivering a high-quality product. You save time and money, accelerate development cycles, reduce the risk of error, and improve quality and compliance. A good product development solution makes it easy to perform and report on traces so you stay on time, on budget and within scope. Traceability –A subdiscipline of requirements management, traceability documents the life of a requirement, tracks every change, and links its relationships with other items within a project. Trace relationship – A link between items within the scope of a project, a trace relationship helps to assess impact on other items when a change occurs. Upstream relationships – Also known as “backward traceability,” upstream looks at the links between detailed functional requirements and the original customer need and the high-level requirements captured. You use it to ensure that the product remains on track to its original goals. It also helps to avoid scope creep. 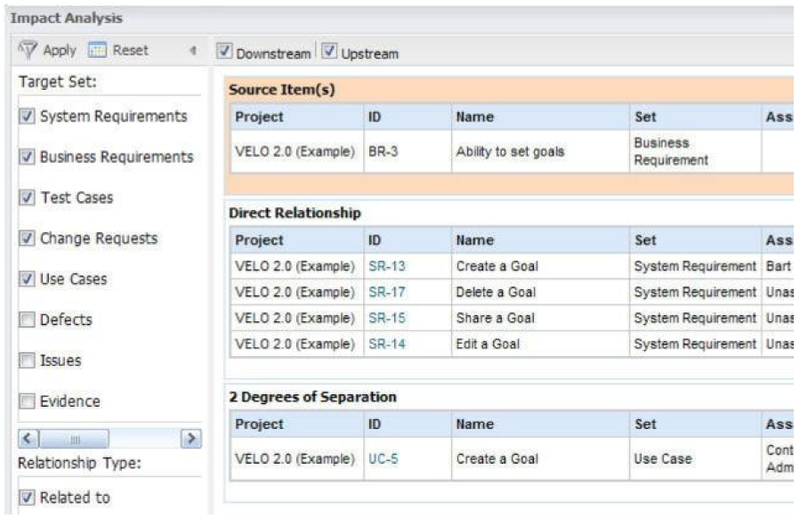 Downstream relationships – Also known as “forward traceability,” downstream looks at the links between detailed functional requirements, test cases, tasks, defects and more. You use it to ensure that you’re building the right product. Coverage report – This report associates requirements with the work products that satisfy them. Often it is used to track tests associated with the requirements on which they are based and the product tested to meet the requirement. Impact analysis – Capture traceability links between requirements, specifications, design and tests and analyze them to determine the scope of initiating a change. Version history – Used for change control, version history provides detailed documentation of each requirement and other items stored in a unified system of record, enabling complete audit trails over the life cycle of the requirement. Specific industries such as aerospace and medical devices require it for compliance.